There are only so many kinds of food people treasure. Craved, savored and given as a symbol of one's love. Yet, so common it can be purchased for 50 cents. This treasured, as well as commonplace item is chocolate (CNN, 1997). Fig.1 A variety of cacao seeds. Please click on the dots above to reach to the year(s) of interest. 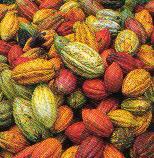 The cacao tree was originated and cultivated in Central and South America. The seeds from these cacao trees were then used to make a variety of products. Now, cacao trees are “cultivated around the equator, and can be found in the Caribbean, Africa, South-East Asia, and even in the South Pacific Islands of Samoa and New Guinea” (Spadaccini, 23rd online edition). Cacao beans consumption can be traced back to ancient Mayan in 500 A.D. and were later on developed for more uses (e.g. spicy drink) in the Aztec civilizations in Central and South America where cacao trees grow abundantly in the forest (Young, 1994). Fig.2 & 3 Cacao trees habitat and cacao tree. The spicy drink was a bitter-tasting drink that mixed with some other local ingredients such as wine, chili pepper, vanilla, pimiento, and so on. These ingredients would be used to add favors to the drink based on seasons. However, sugar was not part of the ingredients to sweeten the drink since sugar was unknown to the Aztecs (Coe et. el., 1996). The Aztec emperor, Montezuma, liked the drink so much that he drank fifty goblets of chocolate per day; and when he was done, he threw the golden goblets away. Only the chocolate was valuable to him but not the golden goblets (Young, 1994; CNN, 1997). Fig.4 & 5 Cacao seeds grinder used in Mayan and Spain. There is some confusion about the derivation of the word "chocolate." The Merriam Webster Dictionary, and many other sources, state that it comes from the Aztec, or more accurately Nahuatl (the language of the Aztecs), word chocolatl. Michael Coe, Professor of Anthropology at Yale, and author of The True History of Chocolate, presents a different view. He argues that the word chocolatl appears in "no truly early source on the Nahuatl language or on Aztec culture." He cites the distinguished Mexican philologist Ignacio Davila Garibi who proposed the idea that the "Spaniards had coined the word by taking the Maya word chocol and then replacing the Maya term for water, haa, with the Aztec one, atl." One other possibility is that chocolate is derived from the Maya verb chokola'j, which means, "to drink chocolate together" (Spadaccini, 23rd online edition; Young, 1994; Coe et. el., 1996). It is believed that Christopher Columbus was the first European to discover the existence of cacao tree. It is also believed that Columbus seized some cacao plants from the natives to bring back to Spain. Actually, cacao beans were used as currency for the native South Americans at that time. However, the Spanish King and his court overlooked the value of cacao trees and their seeds values. Not until twenty years later when Columbuss fellow explorer, the Spain's Hernando Cortez, who realized a potential commercial value in the beans when he learnt more from the colonized countries such as Honduras (Young, 1994; Smith, 2000; Spadaccini, 23rd online edition). Soon chocolate would make its way across the Atlantic -- first to Spain, and then to the rest of Europe. The first official shipment was made in 1585 from Veracruz to Seville’ (Spadaccini, 23rd online edition). Fig.9 Step1 - First shipment of cacao seeds to Spain was in 1585; Step2 - Chocolate was introduced to the rest of Europe by 17th Century; Step3 - Chocolate was introduced all across the Atlantic; Step 4 - Chocolate was introduced to the rest of the world by 18th Century. It was still served as a beverage when the Spanish first brought chocolate back to Europe. However, the chili pepper that made the spicy drink was soon replaced by sugar to make a sweet beverage. The sweetened chocolate beverage was a luxury that only a few could afford. However, by the 17th century, the drink became common among European nobility. In London, chocolate was more widely available, and those who could afford it could enjoy the drink in coffee and chocolate houses (Simmons, 1976; Brenner, 1999; Young, 1994). Wondering if you can enjoy a nice cup of hot chocolate or other chocolate related products in the Lower Mainland of British Columbia, Canada? Check out our section for Local Flavors of Chocolate. Also, check out our section for Consumption of Chocolate to see which countries consume the most chocolate in the world. As the demand for cacao increased, more European countries such as France, United Kingdom and Holland started cultivating cacao in their colonies in the Caribbean, Ivory Coast of Africa and a few parts of South East Asia (Simmons, 1976; Baker, 1891). The expansion also meant slavery and privation and we will discuss more about this in the section of The Dark Side of Chocolate. Fig.10 & 11 Some other steps on drying cacao seeds. 1828 marked the modern ear of chocolate making when Dutch chocolate maker Conrad J. van Houten patented an inexpensive method for pressing the fat from roasted cacao beans along with other processes to create a fine powder known as cocoa. The powder was then treated with alkaline salt that help the power the mix the water easily. The creation of powdered chocolate made it easier to mix with water, sugar and a possible combination of other ingredients to make chocolate a solid form. Many other chocolate makers began to build on Van Houtens success to make a variety of chocolate products. (Want to know some recipes of chocolate? Check out our section for Recipes of Chocolate and for more information about chocolate production, check out our section for Production of Chocolate.) In 1894, English chocolate maker Joseph Storrs Fry produced what was arguably the world's first eating chocolate (Brenner, 1999; Spadaccini, 23rd online edition). Fig. 12 & 13 Another way to extract cacao seeds. 'Today, the Swiss are famous for their chocolate, and rightly so. In the late 19th century, they developed a number of processes that contributed greatly to creating the solid chocolate candy that we all enjoy today. Two major developments occurred in 1879. First, Daniel Peter, a Swiss chocolate manufacturer, had the idea of using powdered milk (invented by Swiss Chemist Henri Nestle in 1867) to make a new kind of chocolate, milk chocolate. Second, Rudolphe Lindt invented a process called "conching," which greatly improved the quality of chocolate candy by making it more blendable' (Spadaccini, 23rd online edition). Fig.14, 15 & 16 Examples of edible chocolate.